Thinking about opening an online shop or e-commerce store, but don’t know where to start? We’ve created a simple step-by-step guide to help you get started. When a member of Kickstart asked for advice on starting an online shop, we knew just the person to ask – fellow member Nerissa Buckell from online gifts, homewares and accessories website Crimson Tiger. Nerissa’s advice was so good that we thought it was a shame not to share it. So here it is – her step-by-step guide to starting an online shop. The first thing you need to do when starting an online shop is buy a huge notepad! It may sound like an obvious comment, but you’ll need one to scribble in as you think of things. I personally love the ones with a couple of dividers as it can keep my notes and to do lists in order. It’s not uncommon to see people with a pushchair and young children at the gift trade fairs, so if you do struggle with child care don’t be put off. Trade shows can give you a good feel of what you might want to stock, and they also run seminars that will give you some good advice. Once you have seen some of the stock that is available, you’ll get a feel of the style you want to portray. Sleek, modern, vintage or Scandi etc. This will help you find your character of your website. Next, start a mood board with images from magazines and anywhere you see something you like. This will come in handy when you’re trying to describe the feel you are looking for to web designers and graphic designers. It will also keep you on track. When planning your own site, look at the competitions’ websites. What do you like about them, what do you think doesn’t work? And think about when you walk down your local high street. What makes the designer shops unapproachable? What makes the pound shop look cheap? The colours, the font, the clean lines of the store defines the shop, just as they will on the front page of your website. Remember you want to entice any potential customers who land on your front page to explore your products, just as a bricks and mortar shop owner wants to entice window shoppers inside. Once you have a good idea of how you want your business to be portrayed, you need to find someone to design your logo. When planning your logo, consider how it will look on the header of your website, business cards, the little icon that sits on tab when online (a browser tab icon), leaflets and social media profiles. You also don’t want something that will date too quick. Take your mood board and notes to your graphic designer as this will help communicate the image you have in your head. And when you agree a price for a logo and other branding, check how many changes are included in that price. You now need to look at getting your website designed and finding hosting. These are often connected – with many hosts offering web design services, and vice versa. There are many options for web design, far more than I can list here, but here are the ones we considered. Many suppliers make it part of their terms and conditions that you do not sell their goods through Amazon, Ebay, Not on the High Street, Etsy etc. You are in a saturated market and you are a needle in a vast haystack. Listing fees, sellers fees, credit card or PayPal fees add up quick especially if you have a large number or products. Large number of potential customers. Easy to list your products. Payment options are set up for you. Great way to start, build your market up and then expand into your own website. You can go to a web designer or a company and pay for them to create your own basic website. This can cost from around £299. Some will design it so you can change the products yourself and add blogs etc. Many also provide hosting for your site for a monthly charge. Companies like inspired-is.com offer an all-singing, all-dancing website, with security implemented, integrated social media, payment gateways, full optimization, SEO, mobile optimised and so on for around £1,000, including the training to show you how to add products and so on yourself. Building your own site is not as scary as you may think. There are many online videos out there will take you through some step by step instructions. A popular option for this is WordPress. Many of the main hosting sites have this as it’s an easy to load option. You then choose your theme and build it yourself from there. There are plenty of free themes to choose from, but if you are setting up a shop you will probably want to spend a small amount on a paid theme that fits your business and your design aesthetic. Get used to thinking in US Dollars, as it seems everything to do with websites is in dollars. Themes can cost from around $49 (that’s about £35). You can buy a theme from places like www.themeforest.net, you then have to add plugins like Woocommerce, which is a plugin that gives you the checkout, wish list etc. Other plugins are available so you can make personal changes to your website. With the use of the themes and plugins you can create your own personalised website that fits in to your businesses personality and your products. You can also grow what your website does as your business grows. You are not restricted by your theme as to how many products you stock. WordPress have regular updates to improve the service and also for online security, this then means the theme has updates and then the plugins need updating. This is when things can go wrong. The theme update can be a real hassle, even now I dread the email telling me there is an update. Always wait a few days and check forums to see if anyone has had issues with the updates as often there is a lull between everything working well together! You must always back up before doing an update to your theme just in case. Set up for an easy designed shop but you pay a monthly charge according to how many products you are selling. This may seem a reasonable cost at first but then you will be surprised at how quick your stock will grow. You are restricted to the themes they have. In order to take payments on your site, you’ll need some kind of payment gateway. Paypal is the easiest way to set up on your website. It costs 3.4% of the total purchase amount plus 20p for the transaction. However, restricting yourself to just PayPal could limit your sales, as some customers consider PayPal old-fashioned, or they think they have to have a PayPal account (they don’t). If you want to take credit or debit cards on your website you’ll need an SSL. SSL (Secure Sockets Layer) is the standard security technology for establishing an encrypted link between a web server and a browser. This link ensures that all data passed between the web server and browsers remain private and integral. You also need to be PCI compliant. You can read more about this here. Suggested ways to take credit card details and process payments are Stripe, Sagepay and Worldpay. Trade shows are an obvious starting place to source stock, but don’t dismiss local craft fairs – you will be surprised at the number of amazing, skilled people in your area. You might even choose to sell items you have made yourself (only you can be a judge of your ability to do this). We make our own personalised jewellery and range of mugs, tea towels etc. We would find it impossible to do a range that is only made by us, as there aren’t enough hours in the day, but a combination of bought and self-made stock really works for us. Keep in mind that you want a few items that people are more likely to search for, for example Orla Kiely, and then some unusual, quirky items. Also bear in mind that glass and ceramics are not covered by most couriers for breakages, so if you are selling something with a low profit margin and it’s breakable, you could potentially be seeing a loss if it arrives to the customer broken (you’ll also need to use a lot of packaging, so bear that in mind when pricing). Some suppliers send items direct from them when you have an order. This is great if storage is an issue, but it also means you are relying on them to get everything out correct and on time. You also are unable to add your brand personality in your packaging. You’ll also need to insure any goods you story (most insurance companies will only cover stock if it’s stored in a brick building with a metal or tiled roof). When assessing how much space you will need, keep in mind that if you are buying from a trade supplier you usually have to buy an average minimum of six of each item, plus your packaging needs. Boxes may come flat packed but they take up a lot of room, as does rolls of bubble wrap and peanuts. Whatever you do, don’t skip this step. If someone cuts themselves on an item that arrives broken, you will need insurance! I’ve mentioned pricing a few times, and it’s an important step. You need to charge enough to cover ALL your costs and make a profit, but you also need to be competitive. It’s worth pricing up and researching products before you invest in them. You don’t want to order a large number of a product, only to find you’d need to sell it for double your competitors’ prices just to break even. Once your business is ready to go, you need to spread the word about it. It’s important to spend time creating a proper marketing plan – this stops you spending too much money without tracking whether it’s delivering any results. Test and measure every marketing strategy you implement, and over time you’ll start to get a good idea of what works for your business, and what doesn’t. Good luck building your online shop! 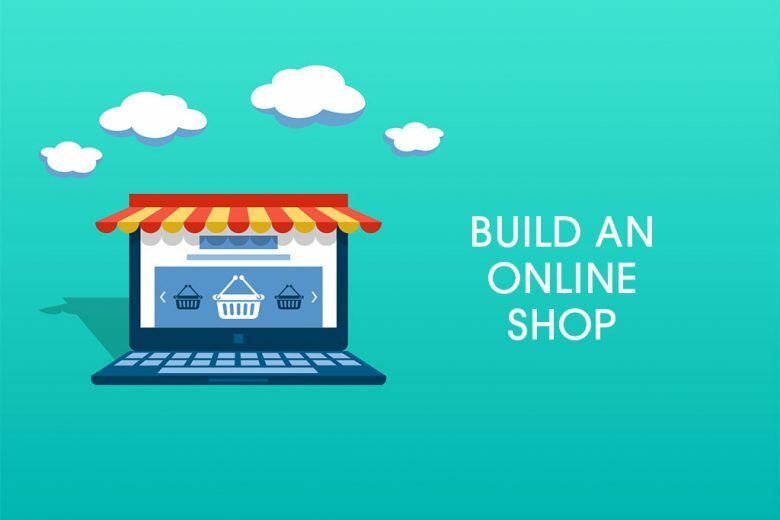 Starting an online shop may seem daunting and take you way out of your comfort zone at first, but once you start looking at your options and begin building it, you’ll be amazed at how quickly you become an expert. You may find you need to learn a few new skills like social media, SEO, copywriting and keeping organised, and will want support and a sounding board. But there are plenty of resources out there to help, including Talented Ladies Club’s Kickstart, which helps with areas where your skills are not as strong as you need them to be. Nerissa Buckell owns and runs online gifts, homewares and accessories website Crimson Tiger.